This is the classic boy meets girl, except – the guy is a psychopath. This psychological thriller is lead by the hauntingly well-cast Penn Badgley. The show follows Joe Goldbergs unhealthy obsession for a woman he serves in his bookstore. His love interest Guenevier Beck, played by Elizabeth Lail, is completely oblivious to what she has unwillingly stepped into the middle of. The charismatic book store manager is desperate to prove he is ‘the one’ – but what lengths will he go to? We will leave that up to you to find out. Joe Goldberg will have you on the edge of your seat the entire time – the twists and turns are endless. We guarantee you’ll have no clue how it’s going to end. With season 2 set to hit our screens later in the year, we can not wait to see where ‘You’ will take us next! “At the end of the day, people just turn out to be disappointing.” But, don’t worry – Netflix has absolutely nailed this one! Finally… the first official Netflix original to be created in Aus. Critics are absolutely raving about this new supernatural series that has had everyone begging for more. Sirens have washed ashore and are determined to take over a local fishing village. The storyline follows Cal McTeer, a young woman who has returned home after spending 10 years in juvenile detention and prison. She sets her sights on exposing all the juicy secrets of the town whilst investigating the commune of half Sirens, half humans – known as ‘Tidelanders’. Tidelands stars some awesome Aussie talent (which we love, love love!). Charlotte Best in the lead role of Cal McTeer. Other Aussie actors taking centre stage include Madeleine Madden and Aaron Jakubenko. We highly recommend giving this Aussie series a spin – it definitely will not disappoint. This hugely popular UK political thriller has finally hit Netflix. David Budd, a military man turned police officer, doesn’t take too long to win over fans. The thrilling series, starring Richard Madden, follows his time as the principal protection officer assigned to British Home Secretary – Julia Montague. Montague is played by Keeley Hawes, whose character is desperately trying to pass a strict piece of national security legislation that many are opposed to. This extremely popular series will have you on the edge of your seat the entire time. 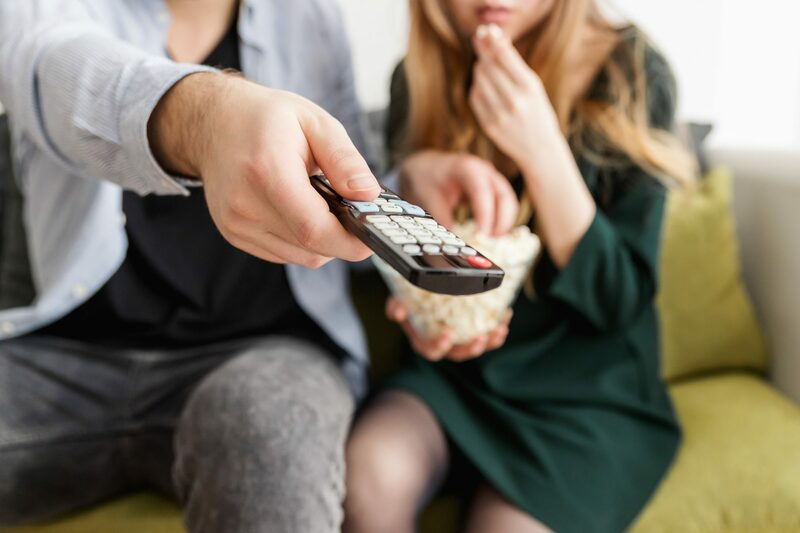 With more twists and turns than you can poke a stick at, it’s no wonder Netflix bingers have been highly anticipating its debut on Aussie screens. No wonder it’s been one of the biggest shows of 2018/19. The critically acclaimed 1959 gothic horror novel, The Haunting of Hill House has been one of the biggest new additions to drop on Netflix this 2018/19. Although Shirley Jackson’s novel has hit the silver screen in two previous films, this is the first time it has been re-imagined for a TV series. All 10 eps are now available for your binging pleasure and we promise they will not disappoint. As spooky as ever, the series’ focal point is the Crane family. This dysfunctional family are trying to come to terms with their experience in the haunted Hill House. Hugh and Olivia Crane decide to move into Hill House with their 5 children – Steven, Shirley, Theodora, Nell and Luke – in 1996. Their dreams of renovation and resale go south fairly quickly when things start going bump in the night. This isn’t just your typical ghost story – jumping between present day and the traumatic events of the Crain siblings’ childhood, this story focusses on how this has affected their adult lives. Ultimately, the Crains will be forced to confront the truth about Hill House in a bid to end the terror. Plenty of ‘edge of your seat moments’ are to be had for viewers… we suggest you sleep with the lights on. This one is definitely worth a watch. Ozark has been top of mind when you open your Netflix account lately, and for good reason! Described as the new ‘Breaking Bad’, the main characters Marty Bryde, played by Jason Bateman, and his wife Wendy (Laura Linney) have gotten in a little too deep with a Mexican drug cartel. But, instead of making the drugs they’re laundering the money for the bad guys. As expected, things don’t go exactly to plan. Working for Mexican drug lords turns out to be a pretty dangerous business and the couple soon find themselves uprooting their family in Chicago and escaping to the seemingly idyllic Ozarks region. But, (surprise, surprise) it’s not that easy to escape a Mexican drug cartel – things don’t go exactly to plan. This binge-worthy series is a must view for fans of the genre – it will definitely have you begging for more. This psychological thriller focuses on the life of a seemingly boring Mother who suddenly decides to commit murder in cold blood. During a Saturday outing to the beach, Jessica Beil, who plays the lead role of Cora Tannetti, brutally stabs and murders a young man on the shores of the busy beach. Nobody, including her husband, can understand why she has done it. The series follows the investigation by leading Detective Dan Leroy, played by Dohn Norwood, into the psychology behind why Cora did what she did. This series is literally one of the most interesting dramas you will watch. A bit of a slow burn, but we promise, once you are hooked, The Sinner is absolutely binge-worthy. I think we can all agree that 13 Reasons Why took the Netflix audience by storm with both seasons 1 and 2. With season 2 as one of the highest rated shows on Netflix in 2018, many of us will agree it is definitely binge-worthy. For those who don’t know, the show follows the reasons why leading character Hannah Baker decided to take her own life. With 13 tapes to explain each reason, 1 episode will simply not be enough with most viewers having finished the entire series in a day. Yep – it’s that good. Although season 1 is rather confronting, touching on a range of social issues plaguing modern society across generations, season 2 is even more graphic. As we have now heard all 13 tapes, the aftermath has set in and every shocking secret is out in the open. But, how has this affected our main characters Clay Jensen, Jessica Davis, Justin Foley, Tyler Down, Mr and Mrs Baker, Mr Porter and a whole host of other characters? Relationships are set to be exposed and friendships are shaken to their very core in the second series of this must watch social expose. Although this series will have you on the edge of your seat the entire time, we do warn that it deals with many confronting issues that are facing society in our modern world. Keep the tissues handy. On a lighter note, this 2018 teen romance is definitely a must watch starring Lana Condor, Noah Centineo, Janel Parrish. If you love a bit of light-hearted easy viewing. Lare Jean Covey is a typical teenage girl. She writes letters to all of her past loves, however, these letters are meant for her eyes only. Her life is somewhat normal until the day her letters are exposed to every boy she has ever loved before, resulting in them confronting her one by one. This movie takes some seriously hilarious and romantic twists and turns as it weaves its way through the life of a somewhat typical high school girl. If you love a bit of high school fun this movie will definitely take your fancy. Perfect easy viewing for a girls night in and suitable for all ages. We suggest grabbing some popcorn and a blanket and enjoying this chick flick with your besties. If you haven’t heard of Stranger Things you must be living under a rock. This captivating series focus on Will Byers, a normal kid from the town of Hawkins in Indiana, who goes missing in a series of strange events. Everyone is on the search for Will including his mother, Joyce; his brother, Jonathan; his friends–Mike, Dustin, and Lucas; the police chief, Jim Hopper. As you can probably guess, the story gets weirder and weirder. With a string of supernatural events and a strange young girl with a shaved head appears on the scene the audience slowly learns about secret government experiments and a series of unnerving supernatural forces. We think Stranger Things is absolutely awesome. A definite must see if you love a good supernatural thriller with a little bit of fun on the side. Grab your pals and let your imagination run wild! Well, we are definitely spoilt for choice in 2018/19 when it comes to choice. Netflix has definitely produced the goods in terms of binge-worthy TV. There is something for everyone and so much more to come throughout the year. The only problem you’ll have is dragging yourself off the couch! Best Binges On Netflix (Who Said Binge Is A Bad Thing?) Overall rating: 4.8 out of 5 based on 60 reviews.